The American Saddlebred evolved during the 1800's in the Southern States, primarily in Kentucky. Originally known as the Kentucky Saddler, it was the result of selective breeding of the Canadian and Narragansett Pacers, the Morgan Horse, and the Thouroughbred. It was an elegant horse, and looked wonderful pulling a carraige to church on Sundays. 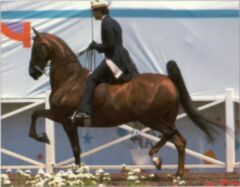 Although fine as a harness horse, the modern Saddlebred is the premiere showring horse, exhibited under saddle. As a five-gaited horse, it is shown with a full mane and tail. In addition to the usual walk, trot, and cantor, the Saddlebred performs the slow gait, a prancing four-beat motion with a deliberate pause before each foot-fall, and the "rack", a full-speed flashy four-beat gait. The American Saddlebred stands at 16 hands, and in addition to the show ring, can cut cattle, jump well, and is a pleasure to trail ride. It is an excellent competitor in dressage. a real pleasureable horse to own. Read the next horse breeds article on American Standardbred Horse.